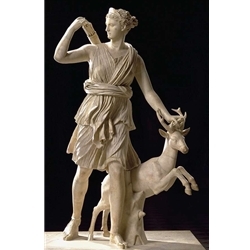 Artemis the huntress, called "Diana of Versailles"
More information on this sculpture can be found at the link below. All marble sculptures are custom made one sculpture at a time. The artist always starts with a clay model. Sizes and prices on our website are suggested sizes and prices. you would prefer and we will give you a free quote. A 30% deposit is required to start the project.